King of England between 1485 -1509. Henry was from the House of Lancaster who were rivals of the House of York. The House of Lancaster had a red rose as their symbol. 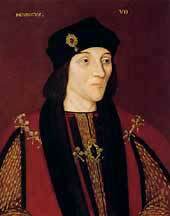 Henry VII fought against Richard III at the Battle of Bosworth in 1485. Henry defeated Richard and became the first Tudor King of England. In 1486 Henry married Elizabeth of York to bring the Houses of York and Lancaster together. Henry kept the power of running England to himself rather than letting Parliament make laws and collect taxes. He governed through the King's Council. This was made up of 200 noblemen, gentry and churchmen, whom he chose. The council's real work was done by small courts and committees, closely controlled by Henry himself. An important part of the King's Council was the Court of the Star Chamber. The court was a group of royal advisors which met at Westminster in London. It often held trials of rich and powerful people who were accused of breaking the laws of the land. The Earl of Warwick was nephew of Edward IV (the Yorkist king who died in 1483). Henry had the Earl imprisoned in the Tower of London so that he would not try and become king and get rid of Henry. In 1486 Lambert Simnel pretended he was the Earl of Warwick. A rebel army was formed to fight against henry. The rebels lost and Lambert was sent to work in the King's kitchens. Perkin Warbeck claimed to be a son of Edward IV and tried to invade England from France with his troops. Warbeck was captured in 1497 and put in the Tower of London. He was executed in 1499 along with the Earl of Warwick. During the reign of Henry VII there was peace in the country for 30 years after many years of fighting between rival groups in England. When Henry took over the country it was very poor. The King paid off all the debts and the country grew rich again. He made sure that every penny of tax was paid to him. People who lived on his lands were charged higher rents. Anyone who broke the law had to pay large fines. Edmund Dudley and Sir Richard Empson were special ministers appointed by Henry to collect taxes. They were not very popular.